The no-confidence motion is the very last chance for the system to self-correct. If it fails, and the Prime Minister wins, confrontation will be the order of the day and stability will be a mirage. If the PM prevails in Parliament on April 4th, who benefits? If he loses and the no confidence wins out, who benefits? What is the scenario if the PM wins? 1. The PM and by association, the government, will remain delegitimized by the bond scam. 2. The government will be either be more divided than ever or will be devoid of much of its moderate-centrist component, the SLFP. 3. Socioeconomic protests will resume and intensify because of his policy package and the austerity measures he will introduce to stabilize the economic crisis. 4. Ethnic polarization and ultra-nationalist resistance will grow as he moves on ethno-constitutional reform and the Geneva resolution. 5. The oppositional space will be enlarged by the infusion of a large number of SLFP MPs who wish to avoid electoral elimination by remaining in his company. 6. Oppositional tactics will become more confrontational as special courts are used to victimize political opponents in the run-up to national elections next year. 7. The government will be rocked by street protests from multiple sources and finally defeated at next year’s elections leaving a bloody aftermath and a more militantly majoritarian nationalist successor regime. What is the scenario if the PM loses the no-confidence vote? 1. Everyone including his party the UNP will get that rarest of opportunities: a second chance; a chance to turn the page; to write a new chapter; to course correct and move on. 2. Political confrontation will lose its sharper edges. New patterns of outreach and shifting consensus will become possible. A new dynamic may emerge. If the PM wins, the UNP loses because it will be saddled with a man who has minimal public appeal, and will further ruin the UNP’s electoral performance and prospects (whatever the token reshuffle of posts he engages in within the party, short of resignation). What is most striking is that no one wishes to take over the leadership of the UNP at this moment because it will be impossible to resuscitate it and no prospective leader wishes to lose an election. This is how badly the UNP has been wrecked by Ranil’s leadership! Some prospective leaders may accept the post of presidential candidate but that too is doubtful and the grapevine has it that the preference of the most likely successor is to take over the party after the 2020 election. Even if a successor takes over in time for the presidential election, he is unlikely to be able to effect the kind of dramatic turnaround that would be necessary for an unexpected win in a context of heightened anti-incumbency emotions. If the PM wins the no-confidence motion the President loses out, because he will be saddled with a partner who has an electorally toxic effect on his base, the SLFP. President Sirisena knows that even if he is the ‘Hansaya II’ candidate in 2019, he will lose, due to the unpopularity of the Ranil-Mangala UNP’s neoliberal minoritarian policies. Even his best case scenario of a Sajith supported candidacy, a replay of 2015 is unlikely to succeed, given the downward spiral of the economy. Against such an economic backdrop, Sajith’s input and that of the minorities, is unlikely to able to match Mahinda Rajapaksa’s, as prospective political partner/investor. Whichever way the no-confidence motion plays out, there is no downside for Mahinda Rajapaksa and the JO. Unless he is outflanked or offered some competition in that department by President Sirisena and the SLFP in the next few days, he would have renewed his role as the leader of the anti-UNP struggle and the progressive patriotic forces. If the PM wins, and the SLFP stays in government, it will be caught both ways. It will be kicked around by the UNP and it will lose whatever is left (13%) of its vote. What the SLFP needs to do if the PM wins is to make a dramatic cross-over immediately after the vote on the night of April 4th, either joining the JO or constituting itself a liberal nationalist opposition together with the UNPers who may have voted for the motion. Such a moderate nationalist grouping can become an ally of the JO, recreating the traditional center-left anti-UNP alliance. Between the JO-SLPP’s 40%-45% and the SLFP’s 13%, victory at all future elections is assured. This would help President Sirisena too, as the SLFP in Opposition would be his shareholding in the growing oppositional space. The TNA would also have to vacate its undeserved, artificial occupation of the Leadership of the Opposition. Ironically, it would be far better for the TNA’s Sampanthan were the PM to lose and the SLFP to remain in office with JO support as the new government, rather than for the PM to win and the SLFP to come into the Opposition tipping the balance in favor of Mahinda Rajapaksa or his nominee Dinesh Gunawardena as Opposition leader! If the PM loses and the no confidence motion is carried, then several possibilities open up. The same government minus Ranil, but with a reshuffle. A government of the UNP dissidents and the SLFP, backed by the JO, in which a dissident UNPer is the PM. A government of the UNP dissidents and the SLFP, under SLFP dominance, backed by the JO, with an SLFP PM. A government of the SLFP, backed by the JO. A government of the SLFP with selective/token JO participation. A power sharing arrangement between the SLFP and the JO, with or without minimal UNP (dissident) participation. An interim government, of the SLFP backed by the JO, transitional to early general elections. The government would have shifted from the neoliberal globalist Right towards the moderate Center. The reconfigured government will be more in keeping with – though not exactly reflective of — the actual electoral balance in the country as a whole. It will be more broad-based and therefore, more ensure greater stability. In any of the post-Ranil scenarios, the upside greatly outweighs the downside. The only scenario in which the downside greatly outweighs the upside, is a victory for the PM in the no-confidence vote. That outcome is clearly the worst case scenario. However, even the scenario of a win for the PM on April 4th is not entirely devoid of an upside. If one is not looking at things from the perspective of the national and the public interest, as I try to as a political scientist, but from a strictly partisan perspective of an oppositional electoral sweep, what could be a more delightfully entertaining prospect for a nationalist-populist opposition than to have most of the SLFP as ally and all of the SLFP votes in the kitty, while Ranil Wickremesinghe is one’s rival, against the backdrop of surging taxes and a sinking economy? Diaspora pundits and Ranil’s Fifth Columnists within the oppositional space clutch at the straw of the possibility of Mahinda Rajapaksa supporting the UNP and JVP to abolish the Executive Presidency when the JVP moves a resolution to that effect later this month. This is whistling in the dark—the same tune that went all discordant when Mahinda gave the thumbs-up for the no confidence motion, a thumbs-up without which the JO’s move would have been utterly unthinkable, belying the theory that he was a political partner of Ranil Wickremesinghe. Those who expect the JO to support the UNP and JVP in the abolition of the executive Presidency simply do not know what’s going on, on the ground, including the mood in the JO which drove the no-confidence motion. This was best exemplified in a TV debate last week which featured the UNP, SLFP, JVP and JO-Pohottuwa. A rising star of the JO, Roshan Ranasinghe, the young MP for Polonnaruwa and lawyer, stridently said that he “supports President JR Jayewardene’s executive presidential system” and that “it was wrong for the wings of the Presidency to have been clipped so closely by the 19th amendment thereby contributing to the present deadlock and crisis in the country”, and that “the country needs a strong, rebuilt, executive Presidency”. That is the mood in the JO: a natural, instinctive rebellion against the rightist Ranil Wickremesinghe, a reversion to “strong statism” which is the hallmark of patriotic populism from Putin to Ortega to Chavez-Maduro to Erdogan, and a revulsion towards the ultra-liberalism and state–retreat of the Yahapalanaya ‘Yeltsin’ years. The JO is opposed not only to Ranil but also to ideological Ranilism–the ideology of the weakened and de-centered state. The government delegation’s stand in and after Geneva signaled that the Sri Lankan state is back. Sarath Amunugama said that Sri Lanka will not continue to be a “supplicant” at the UN and will not “make representations to it beyond 2019”. On a continuum, but of much greater strategic consequence of course, President Sirisena dealt a blow to Prime Minister Wickremesinghe’s “economic deep state” by carving away his economic functions by means of a mere gazette (which went unchallenged)! This was just a week after constitutional pundit Dr. Nihal Jayawickrema, writing from Eton, UK, pontificated that “…the President… still possesses a few, relatively unimportant powers in respect of provincial administration and the appointment of President’s Counsel…”! If the PM were to win on April 4th, he would be caught in a pincer from above, below and the flanks, with the JO and the SLFP constituting a powerful Opposition, and Presidential Sirisena still in office. Mr. Wickremesinghe and the UNP would find it impossible to govern. If the PM were to survive and govern with the support of the TNA, then the UNP will effectively be wearing a political cyanide capsule. So hostile will be the public and electoral reaction to such an alignment and its obvious policy path. Ranil At The Kurukshetra, Do Not Cry ! I thought this man would never utter a single word on corrutpoin handling but only his kind of usual bla bla as has been sofar. He makes it very clear his nature again, that the man has ever been that malcious from the day day on in issues regarding RW. This multi criminal gangs led by Rajpakshes looted the state to the core, there the bugger DJ to stay mum but today to talk about BOND scam is beyond my understanding. I think we should treat everyone with a fair spoon. When would this rabblerouser of the style wimal uneducated school drop sense lanken politics is my million dollar question. This man is biased as no other. If the current govt had appointed the bugger as their ambassador to france or anywhere in EUrope, this man would stay shut both ends as many other highly abusive men would do. Dayan please learn to sense it today, tomorrow it will too late. No, give the man his say. Yes, he may be biased but not blind. His view on RW’s Win/Loss = Loss is credible. Having studied the bond scam carefully I think RW should have left long time ago. If he is to go, we should have better men. Sajith is not yet exprerienced enough to lead this nation. He can talk but nothing beyond that. Any leader who will come to power should have the skills to stand against Rajapakshes and their high crimes. They have untold stories. All these should be revealed. Saman. If Ranil were to resign, MARA should have committed suicide long time ago for all the atrocities, murders, rapes and colossal corruptions under his watch. We at least have a couple behind bars and Interpol red notice for another for the bond scam. Gobbels theory has worked 1:1 in SL. That is why Rajapakshes stay like heroes even today. lIKE NOrthkoreans are made to cry in the death ceremony of current North k LEADER. .. people in our country are made to believe that Rajapakshe did everything to them. YES, if current duo would have offered DJ a post – as his parents gave him SINIBOLA, this man would at once shut his both ends and start talking about the good of Prez Sirisena a govt. This man DJ has always been inconsistent by his thoughts. He is the only person calls him as a good political analyst. 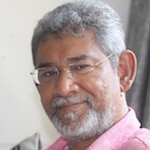 Else that biased Sirasa man – Killi sakkiliya has put this bugger on the altar for one single reason, he has to attack RW, sometimes, forgetting the heavy loads of high crimes Rajapkashes have deliberately made to this nation. It is very unfair DJ should be rehabilitated for everyone s good. RW’s demise is the climax Dayan J Alzheimer has been praying for so long. No wonder then, he is feeling orgasmic, in advance about that prospect. However, distant. Wimal has no control of Dayan’s writing. Leave him alone. Dayan is actually on the wrong side. He should have used his knowledge and expertise to educate the public of the need to reject SLFP+SLPP/UNP+JVP and build a common alternative community force – a third way, in reply to the current self-serving, stale, malfunctioning political system which handicaps our economy. We know Ranil will be the winner, but Sirisena will have to work with UNP by appointing Sarath Fonseka as the minister for law and order. That UNPrs want for sure. Rajapakshes should be imprisoned for all the high crimes they deliberately commited. Today, they are on the wave of rascism against Muslim lankens as no other times before. All those sivura wearing higher criminals such as Ghanasara should be imprisoned as well. He should be rehablitated so that the bugger monk can finalyl tolerate human association. And that mangalaramaya monk should also be subjected to disiplinary actions. Latter both should be forced to derobe and do a favour to lanken Sanga community. Those other monks disguised in SANGA costumes should be jailed as well if they are becoming a threat. Buddha has never asked in his teachings to behave the way they have been upto today. All these should be made clear these men today than later. Who wants to bring back the White Van man Goat Rajapakshe to power? He was the one who massacred the prisoners at Welikada, the one who murdered the journalists, the one who butchered the people at Rathupaswala for asking drinking water. He is a killing machine. He will continue to kill all those who protest even for minor issues and his victims will end up as tiffin for his pet Sharks. A subjective mind is a fertile mind. Yes, but he has always been adding – where he s been coming from…. etc. so people take them as no mistakes. This ballige putha would do anything to bring Rajapakshes back. Rajapakshes can only destroy our nation as well as the country. Megalo mananiac has focuses only on his own selfish gains. Alone the bugger no tto have signed for NCM, says everything. We need a country free from Rajapakshe rascal politics. Shameless people would never consider what they have been talking ABOUT. 1) The biggest barrier for this govt – Wimal Buruwanse and his mouth piece that spread blatant lies … baseless attacks … but people have been made to listen to him by former rascal administration. 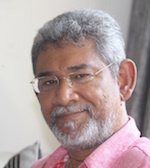 2) The second mouthpiece is Dayan Silva Jayathilaka (with mixed genetics): Unfortuantely, this bugger has always been very personal for some childhood vendetta. Repeating his background he has been coming from, the harm this man has done to this nation is so big. He does not know what he has been uttering from his cesspit. Dayan is no means a successful person. His tongue is so infected by Rajakashe mantra. He cant see it beyond. The day this bugger would ever see it – it will be the successfor all lankens. Don’t drag Wimal for everything. One day when (not if) he becomes the President of this country, what would you do? Hang yourself? I know you would always go up when talking against your billyboy. But we are totally against him. The kind of ballige puthas caused this society to end up in piece by date. Had Wimal WEERWANSE been an educated person, not much of the society would turn out to be that bending to Rajapakshe rascals. As some pseduo monk abused their samaneras in so called buddhist temples in our buddhist domnated country, Wimal weerwasnse has been abused by Rajapakshe rascals for their political surivival. What this bugger di dnot utter from his cesspit at the time, Sirisena was campaining to drive away Rajaakshe. Remember ? So such person to be respected by us ? No in me but some others woudl do. Wimal weerwanse would not be enough to sweep maradana rd if I may say so. Wimal will take the right decision at the right time. I can give a good fight to Mahinda to take Wimal to my side in 2020. Before becoming President of SL, uneducated, corrupt Wimal, against whom criminal prosecution is underway, should get himself a LEGIT national ID card. Don’t you think? He is the only celebrated intellectual of this island. This time RW will be the loser even if he wins. Why? if he wins he will face a troublesome 18 -24 months ahead with all sorts of protests. If otherwise he will face the same and, moreover, it will be a slow death. In the meantime SL will record pathetic GDP figures. Sad but true. What you have described is a “heads I win; tails, you lose “ situation which RW faces vis a vis the forthcoming NCM! What you have described is a lose, lose scenario viz “heads, I win; tails, you lose” which is a well deserved situation for a man who has no regard or respect for his heritage. A born loser RW! If the Prime Minister wins, Dayan Jayatillaka says ~ “………..confrontation will be the order of the day and stability will be a mirage………….”. That is a cheeky warning and must be taken seriously. The Armed Services and Police did NOT contain the practice pogrom 2014Aluthgama and the warning pogroms in Ampara through to Teldeniya. The inciters know that the loyalty of Armed Services and Police is not to the present GoSL. If the Prime Minister loses Dayan contends “…….Political confrontation will lose its sharper edges……. A new dynamic may emerge…….”. The warning is that White-vans will contain any form of dissent. If the PM wins ~ “………..by association, the government, will remain delegitimized by the bond scam……..”. Dayan is suggesting here that the bond issue is the ONLY scam. Dayan also says unashamedly ~ “……….is unlikely to able to match Mahinda Rajapaksa’s, as prospective political partner/investor…………..”. DJ never uttered a single word about over 4000 billons of statefunds that allegedly have been taken away by Rajapkshe s during the 10 years. Where has this bugger’s political matuarity been buried ? Why the bugger cry for the rascals. ? This article is confusing. Why did Dayan write a “pissige palaa palla – the grab bag of a mad woman” at this moment? Is this a deliberate attempt to confuse people to keep the cat in the sack? Hold-on hold-on. Something grabbed my attention. “The aftermath of April 4th.” Aftermath? How come I never thought about that? I need few minutes to gather my thoughts. No, actually I can type right away as I see only two possibilities with 100/100 probability. if Ranil wins the NCM – that part is not necessary as everybody knows he will continue until 2020 despite Dayan’s threat of street protests. In fact, it’s not something new for Ranil as the JO, GMOA, trade unions, JVP, Peratuwo held protests for the last 3 years to distract the public with the knowledge and blessings of Ranil. 1. The possibility of Mahinda already having a secret document signed by all JO guys and SLFP (Maithree faction) totaling 96 (I don’t remember the exact number) pledging support for him and requesting Maithree to appoint Mahinda as the new PM. Maithree has no option other than acceding to that request as there are no other contenders. 2. The possibility of Mahinda having a double deal with Ranil, in the event he is appointed as the PM, to receive UNP’s support to a Motion to abolish the Executive Presidency. JVP which is Ranil’s tail will agree and TNA will give a high five to Mahinda as this is one of LTTE diaspora’s and TNA’s main demands. Mahinda will easily receive all 225 votes (no actually Wimal won’t go back on his word) so 224 out of 225 to abolish the Executive Presidency. Mahinda/JO, who always put self before country as seen in the last 3 years (minus WW) will abolish ExecutivePresidency and go for a ExecutivePM as it is the most feasible way to roll Rajapaksa dynasty for decades to come. This RoshanR’s statement quoted by Dayan is only an attempt to hoodwink the public. The probability of my above 1 & 2 taking place is 100/100, as the moment Ranil is down, Maithree will go down too without any help from UNP. SLFP (M faction) wouldn’t think twice to abandon him and join Mahinda as the former’s days are numbered. Why did JO hide this from Maithree? They should have given him the honour to announce the public that he is offering Mahinda the position of PM allowing him to abolish Executive Presidency for selfish reasons even at the expense of the country. If not Maithree could tell the public that the reason for him engineering an NCM against Ranil via JO is actually for a noble deed, a self-immolation. If I knew I would have saved him from a scathing comment elsewhere. What will happen next? Everybody knows. Although Sinhalese Buddhists show compassion in victory, Rajapaksa clan has an opposite history. Oooo lallaa… that reminds me to get an e-ticket, pack a small bag, put Wimal’s cap on my head (oh, I didn’t get it yet) and say “Adios” to President 2 days in advance, before my name is added to the disappearance list. Oh, please don’t take this as jinx, Mr. President. It actually isn’t my fault. Blame Dayan for publishing a “pissige palaa malla” on CT. Since this is NOT a secret ballot, are you stll confident of winning the no confidence motion? Dayan jayathillaka was a minister of vartharaja Perumal when he declared EElam years back.a strong Marxist then telling the world that all humans should be treated equally irrespective of race.Now after his beard got grey he is uttering something else.May be his DNA has changed. The three hosts on Balayaya Program on Hiru TV were dumb founded, when Dr Wijedasa Rajapaksa, the ex UNP Justice Minister described the damage Dr Ranil has done to this Nation in three years of Yahapalanaya. One host even expressed his concern for his Children and Grand Childrens’ future, if Yahaplanya continues under Dr Ranil and his Rogue brigade. .
That is how bad the country is because of Dr Ranil and his ex Royal mates dodgey deals in the last three years. Dr Wije pointed out the dastardly acts of Dr Ranil even during his previous stint as the PM under his cousin Whiskey Madam. Dr Wije ridiculed Dr Ranil’s guards like Ajith Perera and Bandara as ignorant fools, who didn’t know anything about the Srilankan Constitution although they passed the Law exams to become solicitors. That is how pathetic these UNP dudes are. And allowing Dr Ranil to hijack the CB from the Finance Ministry which is taboo if they understood the Constitution and the Laws governing the Fiscal and Monetary functions of the Government. Finally Dr Wijedasa called Rajapaksa a brilliant strategist, indirectly of course for the latter’s nous to stick the Presidency of the SLFP on Sillysena, to go along with the the Presidency of Yahapalanaya. And we all know what happened to the SLFP at the recent Election. And Dr Wije predicted that they will be wiped out at the next one. So hopefully Dr Ranil will win the NC motion. The most probable outcome is the NCM will be defeated and Ranil will prevail because this is what India wants, and then the next step will be UNP conniving with SLPP and impeaching the good for nothing president. What/how much/when, did Ranil gain from it? I think he was betrayed by the man he chose to run the CB, and did not gain a cent from it. Ranil is the only non-corrupted politician now. He should continue as PM, and become President. I heard, when Rathnasiri Wickramanayake was a minister for Land, he acquired some lands. those lands had been sold to Naveen dissanayeke on thise days when Rathnasiri wickramanayake was ill. this is a reliable source. I do not know anything else.